CaliBurger, the California-style burger chain that more than a little resembles In-N-Out, plans to roll out a "robotic kitchen assistant" that can flip burgers and place them on buns starting in early 2018. The robot is manufactured by Miso Robotics and named "Flippy." 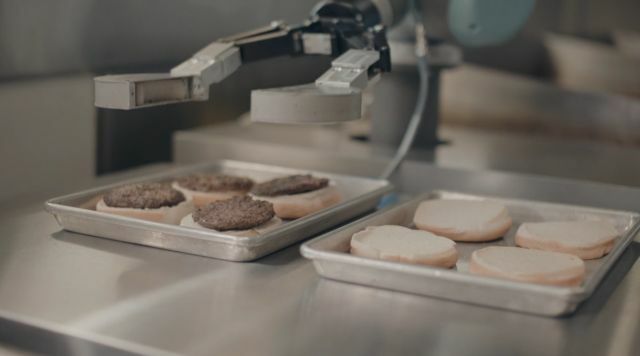 According to the company, the proprietary AI software that runs the robot can improve and adapt over time as it cooks and flips more burgers. Flippy "sees" with cameras and sensors and flips burgers with a robotic arm. It appears a person still needs to actually place the patties down and put cheese on them as they cook but with the labor freed up by the robot, CaliBurger plans to redeploy some staff from the kitchen to the dining room to "engage more with customers."